Camino de Santiago 2013: 6 days 'til the climb-a-thon, 3 weeks 'til Spain! 6 days 'til the climb-a-thon, 3 weeks 'til Spain! EMS is donating tents and sleeping bags for our all-night Feb. 23 climb-a-thon at New York City's Brooklyn Boulders. Much obliged, EMS! Runa Tea is donating literally hundreds of bottles of its refreshing Guayusa Tea for the climb-a-thon -- all those thirsty participants will be very grateful, so thank you, Runa Tea! Our fundraising total now stands at $6776 -- that includes $3000 in climbing pledges that we know about (there will be more). If you have already contributed to either Global Fund for Women or GirlVentures, then we thank you! If you haven't, then please consider contributing here or here. Please remember to donate "in honor of GIRLS ON THE WAY." Remember, 100% of the money you donate goes straight to the nonprofit organization (and not to us!). Help empower females around the world! We're considering bringing lightweight down jackets (the kind that weigh nothing and smush up nicely) on the Camino. The girls might like something warm to hang out in once we're finished walking for the day. Their day-fleeces might be too light for the evening temperatures. We continue to train, though the girls are getting tired of the 6-7 mile loop around our house. 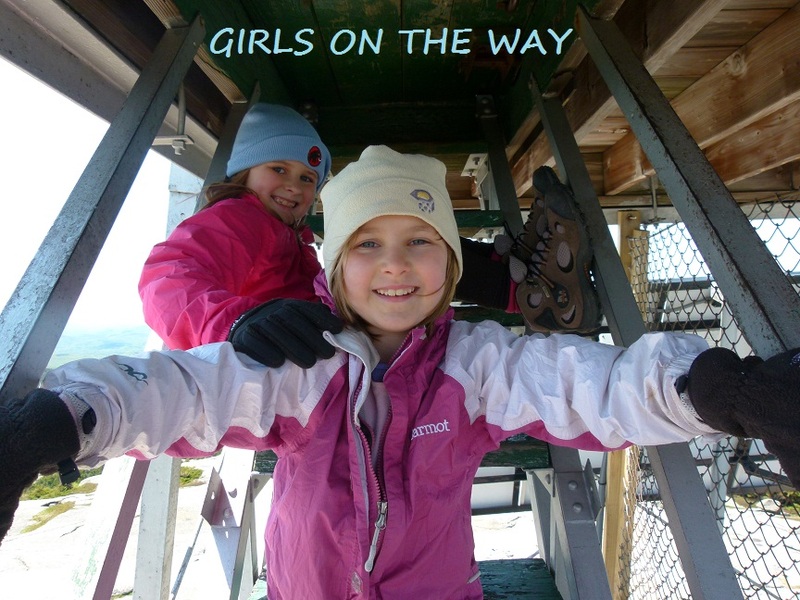 They asked to hike a mountain last Wednesday instead...we don't usually hike mountains on Wednesdays, since the girls have karate in the afternoons...also, last Wednesday had a horrible above-treeline forecast...nevertheless, up we went. We ascended Mt. Pierce, one of New Hampshire's smaller Four Thousand Footers. The path was well tracked out so we barebooted up the peak. The girls had a blast. There were several groups out trekking -- some wore snowshoes, some wore crampons, and some, like us, wore microspikes. It was a wear-what-you-like kind of day, and most everyone was in good spirits and in proper HYOH (Hike Your Own Hike) attitude. Unfortunately, there were a couple of men on snowshoes who copped attitudes at anyone who wasn't also in snowshoes -- in spite of the lack of postholing -- but oh well, there are always going to be people who erroneously think their ways are better than everyone else's. The girls and I were able to ignore the petty negativity and enjoy the company of the other hikers we met on the trail. There were no views to be had above treeline, which is what we'd expected given the forecast. There was, however, some rime ice. ...to a snowy summit cone. I'll be back in a few days with some miscellaneous odds and ends. Almost at our fundraising goal!